Flamenco legend Manitas de Plata – “Little Hands of Silver” – has died in the south of France at the age of 93. During a long international career the guitarist sold 93 million records. 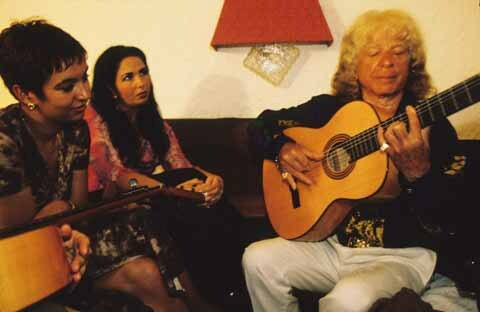 Born Ricardo Baliardos in a Gypsy caravan, he mastered the guitar as a child without being able to read music. Manitas de Plata recorded his first album in 1963 and went on a world tour after a triumphant concert at New York’s Carnegie Hall. As a rising star, Manitas de Plata frequented cafes on the French Riviera and associated with celebrities including actress Brigitte Bardot and the artists Pablo Picasso and Salvador Dali. He had dozens of offspring, and once admitted he could not say for sure how many children he had. Among his children, reports suggest, were various members of the popular Gypsy Kings group. Manitas de Plata’s talent continued to inspire generations of guitarists long after his celebrity had waned. Nonetheless Manitas de Plata died a poor man, having spent much of his earnings on his extensive family, French media report. His daughter Francoise said he died in a retirement home, with family members at his bedside.